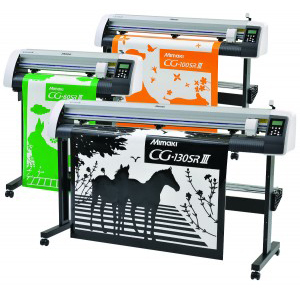 The Mimaki CG-SRIII Series roll-based cutting plotters include a number of features for producing a wide range of contour-cut pieces. A higher cutting pressure of 500g widens the range of materials for various applications. The clamp pressure can be adjusted to cover a wide range of sheets including thick materials. An optional sheet basket enables stable long-length cutting. Intermediate crop marks in the feed direction enable four-point corrections for each segment. This leads to accurate, long-length cutting, even if the image is distorted. Receive status messages through the email notification system for unattended operation. (Colored) Vinyl, transparent PET, (transfer) paper, flock, rubber.